Whether you want to make a heartfelt or fun card, our fabulous Design Team have come to the rescue to give you 8 different card making tutorials that won’t take you long to create. Have a read through to find inspiration to create a card your dad won’t help but smile at! 1. Begin by taking the flamingo design from the Simply Creative Kraft Keepsake 12x12 paper pad, flipping it over and placing your Dovecraft 6x6 Card Blank with a circular aperture on top. 2. With a pencil, draw around the aperture. Use a craft knife to cut out the aperture and cut down the flamingo sheet to fit the front of your card blank, ensuring the fold is along the top, using Dovecraft Perma Fix tape to adhere. 3. Draw around the aperture on to a piece of Dovecraft A4 White card. Cover the bottom half with Dovecraft blue fringed paper using double sided tape. Add Dovecraft confetti glitter to the bottom half of this panel to resemble sea. Adhere this panel behind the circular aperture. 4. Cut the palm tree Die from the First Edition Tropical Dies set in beige, brown and green First Edition Textured Cardstock and cut and layer the pieces to form the palm trees. Adhere to the centre of the panel in the aperture. Die cut three banner shapes from the First Edition Bunting Dies set onto the wood effect paper in the Sweet Nothings 8x8 pad. Add to the top of the card with Dovecraft Twine to form bunting. 5. Die cut the word DAD using the same First Edition Alphabet dies set onto First Edition Black Textured Card Stock. Adhere each letter with glue to the centre of each bunting die cut. Adhere each bunting die cut along a length of Dovecraft Twine. Adhere your sentiment along the top of the card blank. 6. Cut out the letters from the Kraft Keepsake paper pad to spell out the words, ‘Time to Relax’. Next, create a fishtail banner from the wood effect paper from the Sweet Nothings paper pad. Stick down the words you created with glue. Adhere the phrase to the bottom of your card blank, at the front. Add a Simply Creative gold gem to either end of the phrase and to the palm tree to resemble the look of coconuts. 2. Cut a 10cm x 10cm square of abstract paper from the same pad, mat onto a 10.5cm x 10.5cm piece of Dovecraft black card, add to card at a jaunty angle with glue. 3. Trim a piece of stripy paper from the same pad to 6cm x 12cm, layer onto a 6.5cm x 12.5cm piece of Dovecraft black card, add to bottom of card, horizontally, with glue. 5. Stamp the Dovecraft My Hero sentiment on to a piece of Dovecraft white card and cut out in a diamond shape. Layer onto a nesting stamp die cut, add to card using 3D Foam pads. 6. Die cut a selection of Dovecraft Stars onto a piece of black card and add to the card as required. Add Simply Creative Gems to the corners of your card, to finish. 1. Cut a 13cm square of patterned paper from the First Edition Wild Flower 8x8 Paper Pad and stick to your Dovecraft 6x6 card blank. 2. On the back of a sheet of double sided patterned Wild Flower paper, draw the shape of a shirt. Don’t cut out a ‘v’ for the collar though, just cut straight down a couple of centimetres. Leave a little extra length on the sleeves. 4. Die cut sunglasses onto a piece of First Edition Textured cardstock. Using scrap card stock, cut an arm of the sunglasses. 5. Cut an extra little square of paper to make a pocket. Add a small length of Dovecraft Washi Tape to the top. 6. Stick the sunglasses to the top right of the shirt, then the pocket on top and the arm of the sunglasses on top of that. 7. Add a die cut cocktail glass to the right of the shirt. Next, cut a small banner shape out of First Edition Textured card stock and adhere to the bottom left hand corner of your card. 8. Create the word DAD with the Simply Creative Cork Alphabet Stickers onto your banner shape. 1. Using the First Edition Wild at Heart 8x8 Paper pad, adhere a 13.5cm square of dotted paper to a 14.75cm square of striped paper. Stick to your Dovecraft Kraft 6x6 card front using Dovecraft Perma Fix tape. 2. Die cut one of the larger scalloped circle dies onto a piece of blue wildlife paper using 2nd to largest die and adhere centrally to card front using d/s tape and glue. 3. Use one of the biggest dies in the First Edition Bunting Die Set, and die cut it 3 times on to a piece of woodgrain paper from the Wild at Heart paper pad. 4. Next, using the same die set, die cut 3 smaller pennant shapes from pale patterned paper. Glue the smaller shapes onto the larger bunting die cuts. Add a Simply Creative Metallic Alphabet Gold Fabric letter sticker to each one to spell out ‘Dad’. 5. Arrange pennant bunting across card front using 3D foam squares to adhere. Glue a length of Dovecraft twine across the top to go just behind the bunting, create loops in twine if desired, glue into place and trim ends. 6. Use the same Simply Creative Alphabet Stickers across the bottom of card to spell out ‘Go Wild’. 7. Die cut a fox from the First Edition Wildlife die set on to pale brown pattern paper from the Wild at Heart paper pad and position as if walking cross the sentiment and overlapping circle on card front, using 3D foam squares to adhere. Add a small Dovecraft gem to the eye and 3 larger round gems above ‘Wild’ sentiment in line with fox feet. 1. Cut a piece of First Edition Black Out paper down to 15cm square. Distress the edge with the Dovecraft distressing tool. Mat and layer with a complementing 14.5cm square of Black Out Paper, with a distressed edge. Adhere to the centre of your Dovecraft 6x6 card blank. 2. Die cut the First Edition Birthday Wishes Craft a Card die onto a piece of Black Out paper. Cut out the two decorative sections, and adhere with glue the top right and bottom left corner of your card blank. 3. Cut a 10cm x 10cm piece of backing paper, distress the edge. Die cut the pocket watch from the First Edition Clock Dies set twice on to black card, cut one in half, adhere to the back of the 10cm x 10cm piece of card stock, at the top left and bottom right corner. TIP –Before adhering, check you are happy with where they are. 4. Stamp the Dovecraft ‘My dad my Hero’ sentiment on to Dovecraft white card stock. Cut around the sentiment, distress the edge and adhere to the centre of the card. 5. Die cut some of the cogs from the First Edition Clock die set, adhere to the side of the sentiment over lapping the edge. 1. Take a red 6" x 6" card blank from the Dovecraft Kiss & Makeup card pack. Cut a piece of turquoise dotted paper from the 6" x 6" Storyteller paper pad and trim to allow for a narrow border when applying to the card Blank. 2. Carefully add black ink around the edge of the Storyteller paper and then adhere to the centre of the card with Dovecraft Perma Fix Tape. 3. Die cut or hand cut large DAD letters from First Edition black cardstock. Adhere to the upper section of the card using 3D foam pads. 4. Die cut the Dovecraft Star dies, Rocket Ship Die, First Edition Dinosaur and Pirate dies onto your chosen coloured textured card stock. Using the photo as a guide, adhere the die-cuts around, behind and between the DAD letters using foam pads on some of the elements to add dimension. Add ink to the die cuts to add texture and interest. 5. 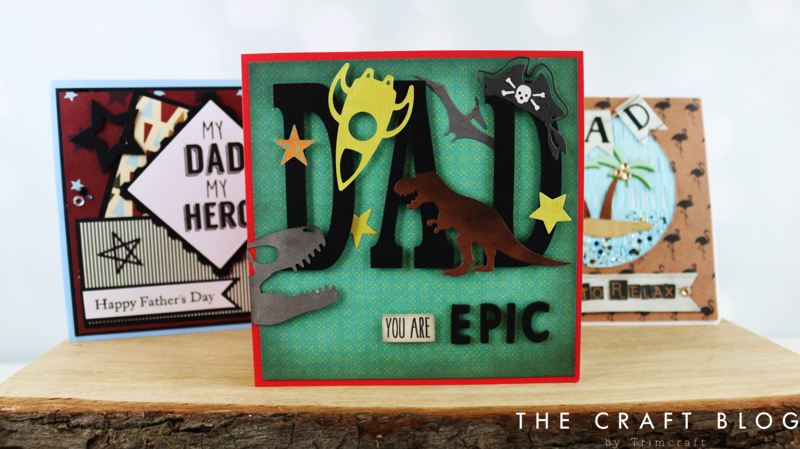 Add the word EPIC in black, Simply Creative foam letters stickers to the bottom right of the card. 6. Stamp the words, 'you are' with Dovecraft Wooden Alphabet Stamps onto a piece of cream cardstock with black ink. Trim the stamped cardstock close to the letters and ink the edges before adhering to the card with 3D foam pads. 1. Begin by making an A5 card blank from a sheet of Dovecraft A4 White card. 2. Take a 12x12 sheet with a heart pattern from the Simply Creative Chalkboard paper pad and trim it down to fit the front your card blank. 3. Next cut a 5cm x 19cm piece of striped Chalkboard paper and layer it onto a larger piece of Dovecraft White card. Stick this down vertically, 2cm in from the left hand side of your card blank. 4. Change the Dovecraft Trimmer to have the wavy cartridge and cut a piece of white card to measure 8cm x 9cm. Next, cut a piece of ‘hello’ paper from the Chalkboard paper pad down to 7cm x 8cm and adhere inside the white card. 5. Adhere your layered squares to the top of your card blank, 2.5cm from the top and 4cm from the left side. 6. With the straight blade in the cutter, trim a piece of dotty paper from the Chalkboard paper pad down to 3cm x 13.5cm and layer onto a slightly larger piece of Dovecraft White card. Glue to the card, 3cm up from the bottom, horizontally. 7. Spell the words ‘super dad’ with the Simply Creative white chipboard letters on your top square. 8. Use the same letters to create the sentiment, ‘UR GR8’ on the bottom rectangle. 9. Finish by adding a Simply Creative blue gem to each corner of the ‘super dad’ sentiment. 1. Create a top fold, 12.5cm x 12.5cm square card with a sheet of Dovecraft A4 White card, leave to one side. 2. Pick your chosen patterned paper from your Simply Creative My Guy 6x6 paper pad and cut it down to a 11.5cm square. Ink the edges and mount to the centre of your card blank with 3D foam pads. 3. Find a complementing piece of My Guy paper and cut it down to 5.5cm x 11.5cm. Ink the edges and stick vertically to the right hand side of your card blank. 4. Cut the bicycle paper down to 9cm x 6.5cm, ink the edges and adhere to the centre of your card blank with 3D foam pads. Cut a 1cm x 8cm piece of patterned paper and stick vertically towards the left hand side of the piece you just adhered on the card blank. 5. Cut out the smallest die within the First Edition Scalloped Circles die set onto a piece of My Guy paper, ink the edges and stick down with 3D foam pads to the centre of the strip you just added. 6. Die cut the cogs and bicycle from the Dovecraft Dies set on to black First Edition Textured Card Stock. Adhere to your card as shown in the photo. 7. Finish by adding 3 ‘plus signs’ along the bottom of the card, on the left hand side. We hope our fantastic Design Team’s makes will inspire your Father’s day creations! Don’t forget to share them in the Inspiration area and to #trimcraft when uploading to social media. Three lovely Father's Day cards made from the team. Lovely cards Ladies. It's a shame the 8 on mine slipped a bit in the post. Great to see all the cards together.